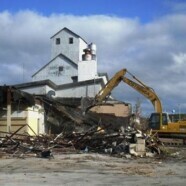 Demolition begins on Sturgeon Bay's West Waterfront | Vandewalle & Associates, Inc.
FROM DOORCOUNTYDAILYNEWS.COM: Preparing to make way for the exciting new development on Sturgeon Bay’s West Waterfront, demolition crews get to work taking down a former Door County Cooperative building. When demo is done, all that will remain standing on the site will be the historic granary, which is planned to be re-used as an iconic part of a new brew pub and restaurant. Photo courtesy of the DoorCountyDailyNews.com.